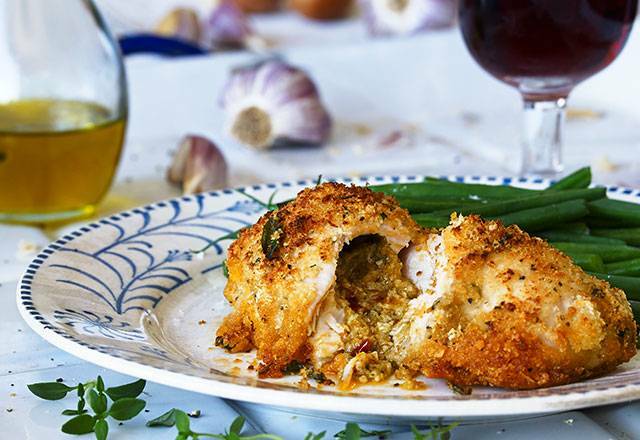 Tender chicken breast stuffed with roasted tomato and fresh basil butter, covered in a golden ciabatta and Parmesan crumb. mark 7. (Be careful not to grill by mistake!). Remove the film but leave the chicken kievs in their wooden tray*. Place on a baking tray in the centre of the oven and cook for 30 minutes until the chicken is cooked through. If using a gas oven, cook for an extra 5 minutes. Leave to stand for 4 minutes after cooking and be careful when cutting into your kiev – the filling gets very hot. Chicken (67%), butter (milk), ciabatta crumbs (fortified wheat flour (wheat flour, calcium carbonate, iron, thiamin, niacin), sunflower oil, olive oil, yeast, salt, sea salt), parmesan cheese (milk), breadcrumbs (wheat flour, water, yeast, salt), water, fortified wheat flour (wheat flour, calcium carbonate, iron, thiamin, niacin), roasted tomato sauce (semi dried tomatoes, sunflower oil, tomato paste, extra virgin olive oil, sugar, salt, dried oregano, dried garlic), onions, fresh parsley, Grana Padano cheese (with egg lysozyme*) (milk), extra virgin olive oil, salt, fresh basil, garlic purée, black pepper, paprika. *This is a traditional ingredient of Grana Padano Cheese. 1. Arrange the slices of tomato on a plate and layer with basil leaves. 2. Drizzle the vinegar and oil over the salad and finish off with a sprinkling of salt and freshly ground black pepper. White wines with a touch of acidity pair well with the oozy, butteriness of this dish. A zingy sauvignon blanc or chablis would be just the ticket.